173 Marlborough is located on the north side of Marlborough, between Dartmouth and Exeter, with 171 Marlborough to the east and 175 Marlborough to the west. 173 Marlborough was designed by architect Carl Fehmer and built in 1881 by Morton & Chesley, carpenters, and Benjamin F. Dewing, mason, one of two contiguous houses (171-173 Marlborough), designed as a symmetrical pair, with 171 Marlborough on a 27 foot wide lot and 173 Marlborough on a 24 foot wide lot. The two houses were built for merchant and ship owner George B. Upton, Jr., who is shown as the owner on the original building permit applications, dated June 13, 1881. George Bruce Upton, Jr., and his wife, Geraldine Ipolite (Russell) Rivers Upton, made 171 Marlborough their home and sold 173 Marlborough. The Uptons purchased the land for 171-173 Marlborough on April 11, 1881: a 26 foot wide lot to the east for 171 Marlborough which Geraldine Upton purchased from Henry Lee (part of a lot he had purchased from the Commonwealth of Massachusetts on April 25, 1871), and a 25 foot wide lot to the west for 173 Marlborough which George Upton purchased from Peter T. Homer (which he had purchased from the Commonwealth on April 5, 1881). 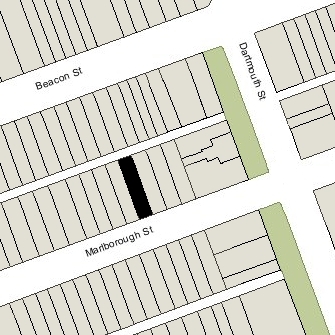 On September19, 1881, George Upton transferred to his wife a one foot strip of land (including with the eastern 6 inches of the party wall between 171 Marlborough and 173 Marlborough) so that the two lots reflected the two houses as built, with the boundary line running through the middle of the party wall. Click here for an index to the deeds for 173 Marlborough. On October 28, 1882, 173 Marlborough was purchased from George B. Upton by shipping merchant George Shattuck Cushing, as trustee for the benefit og his wife, Mary Ellen (Baldwin) Cushing, and their children, Ellen Watson Cushing and George Marston Cushing. They made 173 Marlborough their Boston home. They also maintained a home in Milton. The Cushings continued to live at 173 Marlborough during the 1887-1888 winter season, but moved thereafter to their home in Milton. By the 1891-1892 season, they were living in an apartment at 409 Marlborough. On July 31, 1888, 173 Marlbroough was purchased from George S. Cushing by Helen G. (Smith) Coburn, the wife of George W. Coburn. They previously had lived at 38 Chester Square. They also maintained a home in Andover. George Coburn was a wool merchant in the firm of Hallowell & Coburn, formed in 1865 with Richard P. Hallowell. George Coburn died in April of 1890. 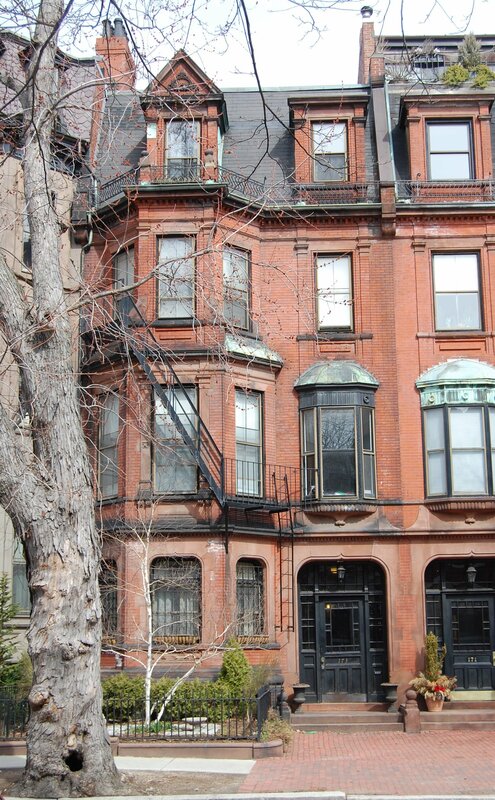 Helen Coburn continued to live at 173 Marlborough until her death in December of 1906. George and Helen Coburn had no children, and in her will, Helen Coburn left 173 Marlborough to William Alexander Donald, who also served as her executor. He and his wife, Cornelia Perry (Howes) Donald, made 173 Marlborough their home. They previously had lived in Brookline. William Donald was a wool merchant and had been associated with George Coburn’s firm, Hallowell & Coburn, from 1865, when it was formed. After George Coburn’s death, he joined with Richard Hallowell to form the successor company, Hallowell, Donald & Company. William and Cornelia Donald’s daughter, Jessie C. Donald, married in June of 1896 to Frank W. Hallowell, the son of Richard P Hallowell. William Donald also had family connections with the Coburns: his sister, Fanny Smart (Donald) Smith, was married to Helen (Smith) Coburn’s brother, Joseph Warren Smith. The Donalds continued to live at 173 Marlborough during the 1912-1913 winter season, but moved thereafter to Chestnut Hill. They also maintained a home in South Yarmouth. Cornelia Donald died in September of 1913 and William Donald died in September of 1914. 173 Marlborough was not listed in the 1915 Blue Book. On October 18, 1915, 173 Marlborough was purchased from William Donald’s estate and heirs by Charles Fessenden Morse. He and his wife, Ellen Mary (Holdredge) Morse, made it their home. They previously had lived at 311 Marlborough. They also maintained a home in Falmouth. Charles Morse had retired in 1913 as general manager of the Kansas City Stockyard Company. He died in December of 1926. Ellen Morse continued to live at 173 Marlborough and in Falmouth until her death in April of 1940. 173 Marlborough was inherited by the Morses’ six surviving children: Laura (Morse) Brewer, wife of Charles E. Brewer; Marian (Morse) Adams, wife of John Adams; Arthur Holdrege Morse; Eleanor Holdredge (Morse) Barrows, wife of George Shattuck Barrows; Charles Fessenden Morse, Jr., and Thomas Robeson Morse. On September 27, 1940, 173 Marlborough was purchased from the Morse family by Florence J. (Smith) Doerfler Joyce, the wife of Myles J. Joyce, a shipper with the Allston Storage Warehouse. They previously had lived (and operated a lodging house) at 397 Marlborough. In November of 1940, Florence Joyce applied for (and subsequently received) permission to convert the property from a single-family dwelling into a lodging house. They continued to live at 173 Marlborough until about 1945. On June 16, 1945, 173 Marlborough was purchased from Florence Joyce by Edward Beaudry and his wife, Noelia (Laurendeau) Beaudry, who operated it as a lodging house. They previously had lived at 10 Isabella. The property changed hands and on September 26, 1947, 173 Marlborough was acquired by Katherine T. Gillis, who operated it as a lodging house. 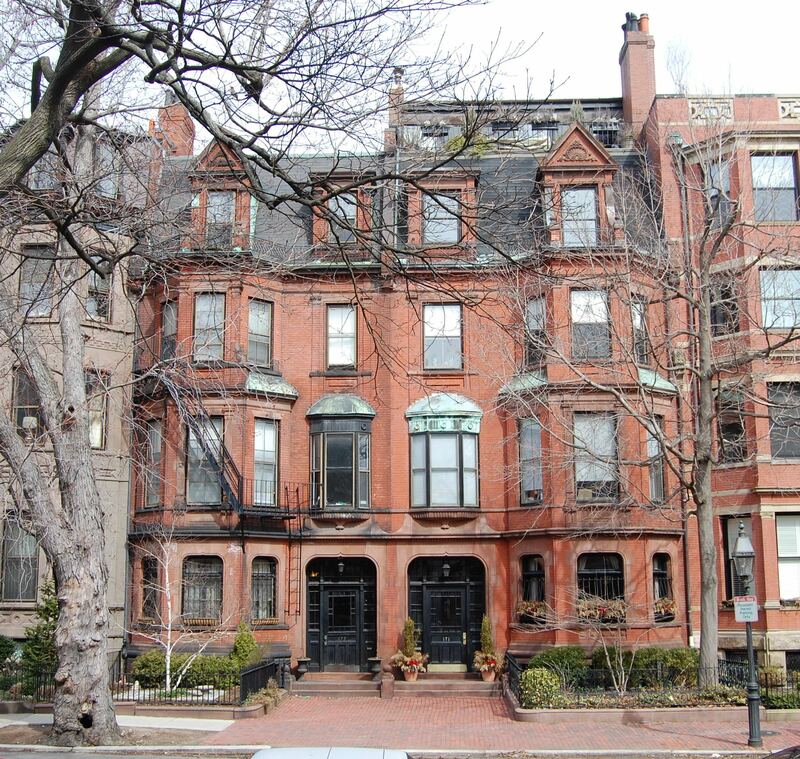 On July 28, 1952, the Second Federal Savings and Loan Association of Boston foreclosed on its mortgage to Katherine Gillis and sold 173 Marlborough to Beatrice Mary (Gaffney) Carney, the widow of Bernard J. Carney, who continued to operate it as a lodging house. She lived in Dorchester, where she also operated a lodging house. 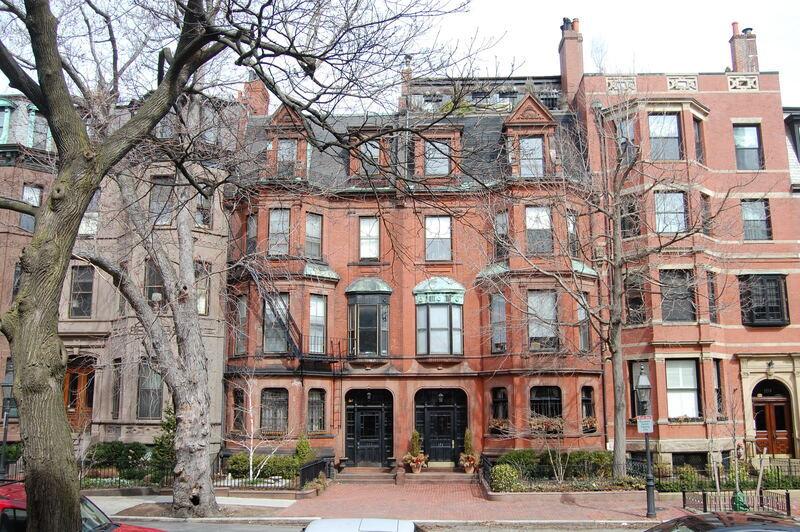 Katherine Gillis continued to live at 13 Marlborough until the mid-1950s. On December 30, 1966, Beatrice Carney transferred the property to her children — John J. Carney, James M. Carney, and Mary Ellen (Carney) Cooper — as trustees of the Carney Realty Trust. In August of 1973, Neal Gold of Watertown filed for (and subsequently received) permission to repair the fire damage and continue the property’s use as a lodging house. On November 14, 1973, the property was purchased from the Carney Realty Trust by Neal Gold’s father, Benjamin Gold, as trustee of the Gold Realty Trust, who transferred the property to Neal Gold on the same day. On October 12, 1976, Neal Gold transferred the property to himself as trustee of the 173 Marlborough Trust. 173 Marlborough remained a lodging house in 2016.